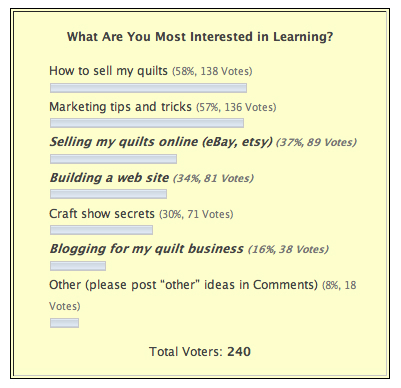 The preliminary results are in, and it looks like we have two top contenders for topic areas on QuiltingBusiness.com. With 240 votes cast, I was very pleased with the participation, and I think the feedback will help improve the site and make it more relevant for the Quilting Business community. So, what I'm going to do is start working on some good content for the site around the top two topic areas first, and then move into the next two topic areas. And, in order to get the community jump-started and excited, I'll be working on a posting or two over the next few days (most likely over the weekend) around selling your quilts, throwing in some marketing tips and tricks. 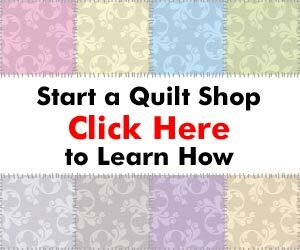 I really appreciate everyone who took the time to participate, and I look forward to making this the most useful site possible for your quilting business.